We've been watching The Walking Dead (our future as a zombie apocalypse, from AMC) for years now. The writing has definitely gone downhill and we've actually been enjoying the spin-off, Fear The Walking Dead much more. This season saw two characters head out on a run, looking for food, and ending up at a greenhouse. It all was so funny I had to share. 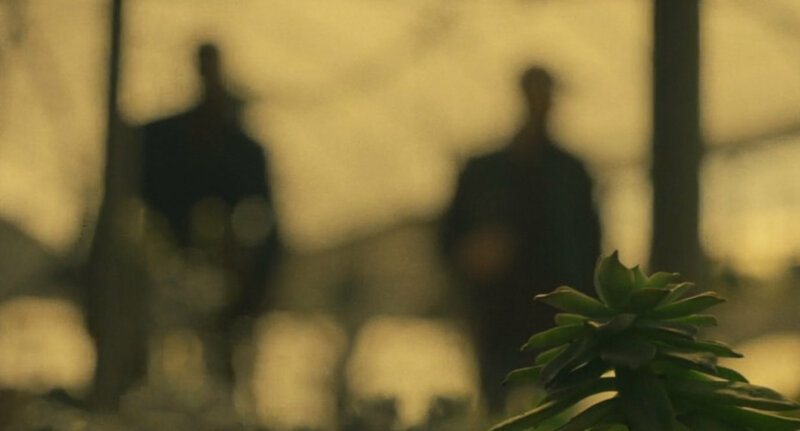 Victor: "look here, it appears our search has born fruit. I'll see if there's a cart." 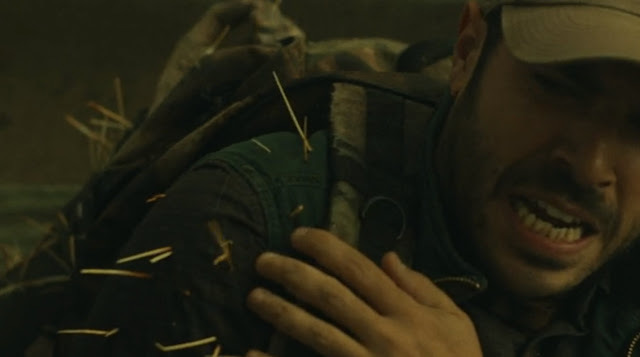 Secondary character is about to be attacked so he grabs a pair of garden shears and....takes care of said zombie. Not before he gets a few of those long spines attached to his shoulder. His comment on the whole event: "pricks"
Words © 2009-2018 by Loree Bohl for danger garden. 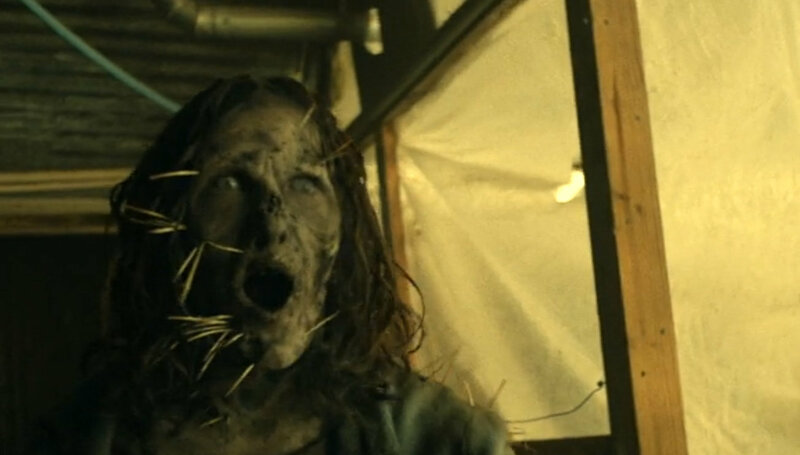 Images are screen shots of AMC's Fear the Walking Dead. Unauthorized reproduction prohibited and just plain rude. Ha! Glad the writers are doing their research (sarcasm). Actually knowing a little bit about plants does occasionally lead to irksome or exasperated moments like this when watching TV, and I suppose that's true of any area of knowledge. I always liked Bones, in part because most of the time the bits of info tossed about concerning plants and insects were right. Indeed, I'm sure there are glowing errors in many story lines, if you know what to look/listen for. I stopped watching both of those shows long ago, I can't remember exactly why, they just didn't grab me any more, hehe. But THANK YOU for the morning's big laugh. This was hysterical. Always happy to provide a laugh! 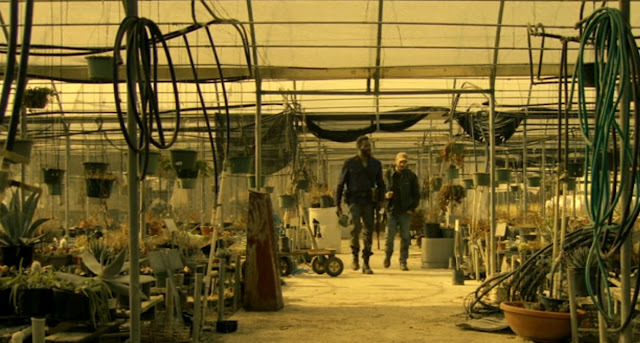 I'm just pleased that after the zombie apocolypse there will still be garden centers to visit. My favorite is when a tv/film scene is filmed in the PNW and the set designers have helpfully set some Dieffenbachia and Schleferra around to make it more 'jungle-y'. Because the entire PNW is a tropical rain forest, right? Make sure you include a dip. I think the trendy way to eat them is like artichoke leaves. While I'm not a TV watcher, I get annoyed while reading novels where the author describes things in opposite seasons flowering together, like tulips and mums, or peonies in the fall. I guess they themselves don't know and count on their readers' ignorance as well. Small peeves! Oh yes! I've got that a time or two. I love this post!!! 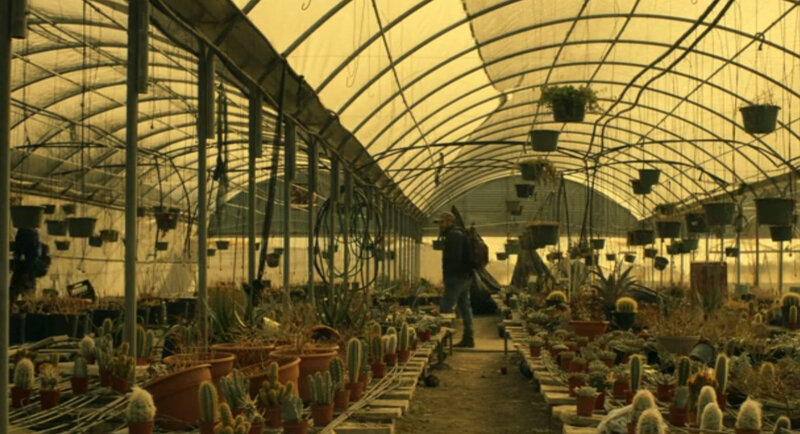 All they needed in the greenhouse would have been replica's of the awesome cow skull a dear friend just sent to my new abode... with some dietary appropriate plants planted in and out of the eye sockets. Visually, it would have been awesome especially with a few worms crawling in and out. 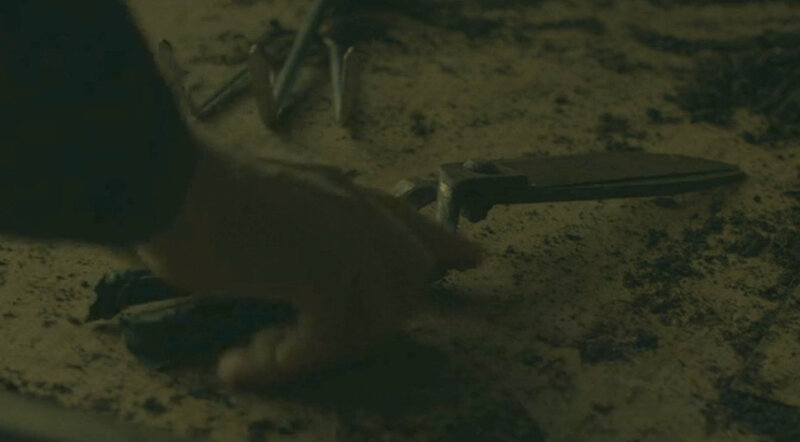 I think you need to explore a second career as a set designer. Maybe they thought it was an artichoke? Ha! Now that would be an inspired mix-up. 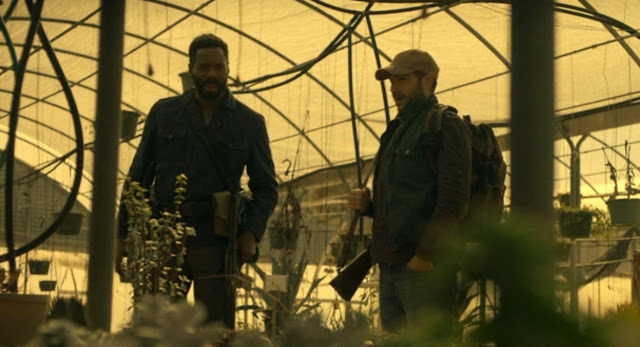 Never occurred to me that garden centers would survive this apocalypse. Now if only they can survive big box stores and Amazon! Too damn funny. How could you not ROFL. This is hilarious. I think you should offer your services as a consulting screenwriter, though. I wonder what the pay would be like? 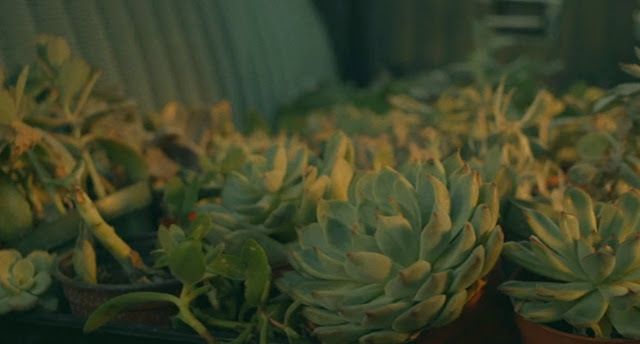 Now some dummies out there are going to assume Echeverias are food. Eye roll! Also amusing are the movies set in the 18th century with gardens full of modern HT roses that did not exist before about 1920. More eye rolls! Of course I wouldn't ever pick up on that one, but a rose expert such as yourself would.